When your relative is being assessed for NHS Continuing Healthcare Funding (CHC), the Clinical Commissioning Group will carry out a full assessment at a Multi-Disciplinary Meeting (MDT). Their Panel of assessors must complete a Decision Support Tool (DST) to assist them in making a recommendation as to your relative’s eligibility for CHC. The NHS Continuing Healthcare Decision Support Tool (October 2018) has 12 headings known as ‘Care Domains’. Each Care Domain is assessed in turn. 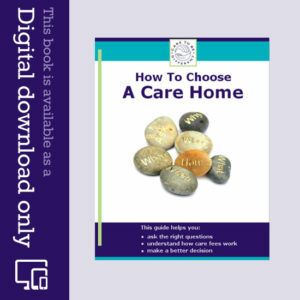 The Care Domains include: Breathing, Nutrition – food and drink, Continence, Skin integrity (including tissue viability), Mobility, Communication, Psychological/emotional needs, Cognition, Behaviour, Drugs/medication/symptom control, Altered states of consciousness & Other significant care needs). To improve your relative’s overall scoring at the MDT assessment and their chances of getting CHC Funding, you need to adopt a holistic approach and consider the interrelation between the various Care Domains and how they impact on each other. As an example, look at the “Skin” Domain – which deals with skin integrity and tissue viability eg skin damage and pressure sores. Risk of skin breakdown which requires preventative intervention once a day or less than daily without which skin integrity would break down. Evidence of pressure damage and/or pressure ulcer(s) either with ‘discolouration of intact skin’ or a minor wound(s). Risk of skin breakdown which requires preventative intervention several times each day without which skin integrity would break down. Pressure damage or open wound(s), pressure ulcer(s) with ‘partial thickness skin loss involving epidermis and/or dermis’, which is responding to treatment. Pressure damage or open wound(s), pressure ulcer(s) with ‘full thickness skin loss involving damage or necrosis to subcutaneous tissue, but not extending to underlying bone, tendon or joint capsule’, which is/are responding to treatment. or necrosis to subcutaneous tissue, but not extending to underlying bone, tendon or joint capsule’ which are not responding to treatment and require regular monitoring/reassessment. Here are some steps you can take to improve your relative’s prospects of getting CHC. Step 1: Get hold of the care home records prior to attending the Multi-Disciplinary Team assessment, and look for relevant entries, care plans, risk assessments and Waterlow scores to assist your case. Step 2: Try to match your relative’s skin condition to the relevant description of those needs in the DST. Step 3: Take a holistic approach and look at the bigger picture. Health needs, such as pressure sores, should be looked at in the wider context and their interaction with other Domains, and not just in isolation under the Skin Domain. Practice Guidance Note 21.2 of The National Framework for NHS Continuing Healthcare provides that “a good quality multidisciplinary assessment of an individual’s health needs… will be holistic, looking at the range of their needs from different professional and personal viewpoints, and considering how different needs interact”. ‘Mobility’ Domain. We know that significantly limited mobility however caused, is considered one of the main driving factors causing pressure sores in the first place, and if prolonged, can cause them to deteriorate. ‘Continence’ Domain. Incontinence can cause pressure sores to develop, especially if sitting for extended periods in wet patches without regular toileting, good hygiene, changes of clothing or incontinence pads. ‘Nutrition’ (Food and drink) Domain should also be considered. Malnutrition, dehydration or poor diet and fluid intake may cause weakness, loss of weight, make the individual more vulnerable to skin tears, hinder or prolong healing and recovery – which may in turn affect skin thickness and integrity. ‘Cognition’ and ‘Altered State of Consciousness’. Onset of serious infection or severe pain from pressure sores can cause delirium and hallucinations, which in turn can impact on mobility and the medication administered. 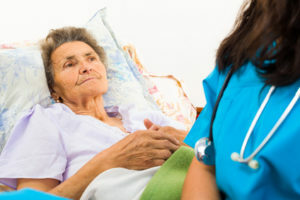 If the individual does not have the presence of mind to know that they are immobile, that they need to move or reposition themselves, are incontinent, have mental health issues, suffer with Alzheimer’s, Parkinson’s, or have other serious medical conditions, then they are at risk of developing pressure sores. ‘Communication’. The individual may not be able to communicate their need to move, or voice that they are in pain from a pressure sore. Staff need to be alert to observe and regularly monitor skin integrity and interpret needs. Implementing the care plan and regular repositioning can avoid pressure sores. ‘Drug Therapies/Medication/Symptom control’. Pain from pressure sores can be so intense it requires skilled intervention to administer pain relief. Pain relief may be required before turning or repositioning. 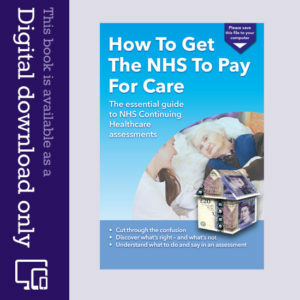 Note: Although the NHS National Framework states that the DST should be used as an aid to decision-making, you still have to consider the interaction between all the various Care Domains and the impact of the 4 key characteristics – ie nature, intensity, complexity and unpredictability of your relative’s needs, in determining whether they have an overall primary health need. In summary, you have to look at the totality of the relevant needs when seeking NHS Continuing Healthcare Funding. Be alert to the likelihood that your relative’s health needs described within each of the Care Domains in the DST could have a direct connection to, and impact upon, at least one or more of the other Domains. Think about the implication of any one health need and its wider effects to improve your chances of success. If your relative needs trained staff to manage those healthcare needs by skilled intervention over a sustained 24 hour period to prevent deterioration, then arguably they may meet the eligibility criteria to get CHC. My mother has grade 4 nasopharyngeal tumour and is totally dependent on tube fed meds food and fluids which she cannot do . She was fast tracked for CHC but at the 3/12 review it was taken away. Her care has been good but she is still life limited and peaks and troughs in her needs . I feel the nursing home did not support me at the assessment as none of the nurses were attending and the assessors one a social worker and the other a trained assessor were fumbling in the notes for any information! I now have to appeal and do not feel I am emotionally able . The real crisis is with CHC assessments in the community as many people are being abandoned and neglected particularly those who have cognitive issues and long term conditions that don’t tick boxes. MDTs should include patients and their representatives IE clinicians but frequently don’t. Decisions are made by panels with no real knowledge of the patient and not all evidence submitted is put in front of the panel. This is against the NHS Constitution and Care Act 2014 but little seems to be effective against these flagrant breaches and breaking of the rules. Panels are cash driven and not patient centred. My father has motor neurone disease I have cared for him for nearly 2 years he is unable to walk , spends 24 hrs a day in bed cannot even re position has the use of one arm his whole life is on a tray in front of him needs constant medical care with open toe wounds is depressed has some routines and behaviour issues due to MND and have found the whole experience a complete shambles with not much consistent help 4 CHC assessments have been requested and failed financial assessment is taking place as well one department waiting or colluding with another until I have employed a solicitor the last assessment went a head with the CHC team not scoring checklist in our presence the meeting went ahead for 5 and 1/2 hrs they were tied so didn’t meet dad when our solicitor was present but rang the nursing home later and wanted to come back and meet him without us or solicitor present ! The malfeasance carried out is extraordinary I feel let down they believe he has his own home that was transferred to me 12 years ago so I am also being asked to provide bank statements from 21 years ago when I payed off dad’s Mortgage it’s so awful when I should be visiting dad and trying to support him I am emotional worn out my stepmother and brother have walked out 2 years ago so I am all he has just awful. My mother has been in a care home for 4 years after having a stroke, after two years in the home she became immobile and now relies on being hoisted from bed to chair to toilet her skin integrity is not good and is always getting sores on her legs where they knock her with the hoist. Oh I forgot to mention she is also partially sighted as has AMD but this became worse with the stroke effects. Her home is in hock to Lancashire County Council with top up fees as I do not earn enough to pay them. I recently had a continuing care meeting at the home with Social Services and the senior at the home and the district nurses but she still does not qualify for funding yet the home want me to move her as they find having two sometimes three members of staff to hoist her is taking staff away from other residents. So I am now looking for Nursing Care as it’s not fair to move her again, but no funding. The whole system in this country stinks for people who have worked their whole life and been frugal saving when it’s all taken, it’s like been robbed and she just doesn’t understand it. I think you have to be on your death bed to get funding. She actually can’t do anything for herself it’s so sad. I feel very sorry for the elderly that don’t have family to help with this and end up in homes they don’t want to be in.